Join Sierra Adventures for a wedding both of you will remember always. 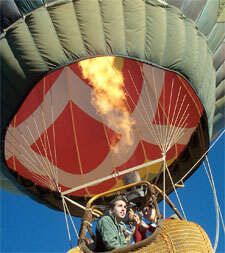 Intro: Ballooning on your wedding will truly provide the most unforgettable memory always shared on this special day. The feeling of warmth and glowing air as it rushes skyward into the early morning darkness with your new adventure partner will last a lifetime each time you look at your pictures. The Tour: Your wedding adventure starts with a pre-dawn weather check (done by us) and a confirmation phone call to your room. If the flight is confirmed, our complimentary shuttle pickup will meet you at any local hotel. At the launch site, your balloon will come to life and stand upright just seconds before whisking you into the heavens, rising up and up over the Sierra and deep blue waters of Lake Tahoe. Your minister will perform the ceremony as you fly away with your wedding party in a four-to-twelve passenger basket. The mountains will appear in all their splendor basking, in the early morning sun. Ballooning is time and weather sensitive, requiring calm wind conditions. We help make it easy, doing the weather checks, transportation, and a continental breakfast en route to the balloon staging area. Your weight and height are required for booking. The Cost: Price is structured by flight location, group size and flight time. Your wedding ceremony includes transportation, planning, snacks and beverage, and guide service. Chaplain rates begin at $250 and must be booked in advance. Wedding licenses are required and available from the Washoe County Clerk Marriage License Bureau in Reno. Go to the Sierra Adventures price list for the latest information, then pay a deposit to secure your trip. Suggested Clothing and Gear: Wool Hat / Gloves / Shell Parka /, Sun Glasses / Boots / Thermax Underwear / Binoculars.